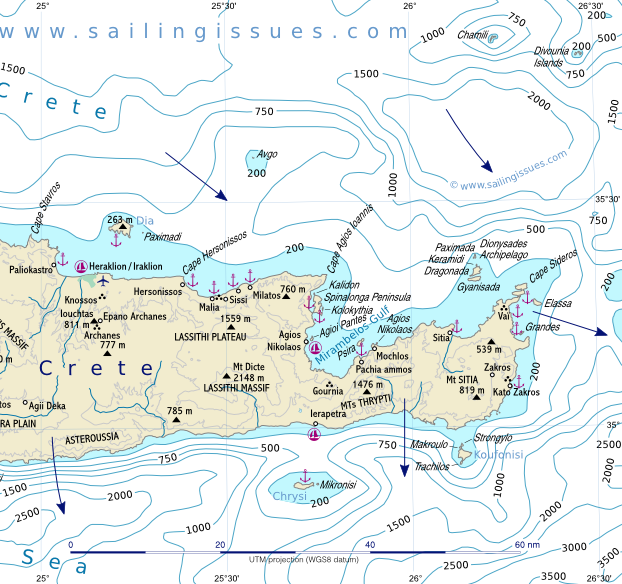 Crete - Κρήτη, the largest of the Greek islands and the fourth largest of the Mediterranean, is the border of the Sailor's Aegean Sea as few sailors, certainly yacht charters, sail further south: it is the most southerly outpost of Europe. The island, celebrated for its Minoan sites is roughly 140 nm long from west to east and ranges in width between 6½ nm and 31 nm. It is broken up by three karstic mountain massifs - in the west the White Mountains (2453 m), which are usually covered in snow; in the centre the Psiloritis range / Mount Ida (2456 m), which also has an abundance of snow; and in the east the Dikte or Lassithi massif (2148 m). These rugged and barren mountains are the home of the wild Goat Capra aegagrus cretica, a subspecies of the wild goat Captra aegagrus that is the ancestor of our domestic goats. Agriculture is mainly possible in the karstic collapse depressions (poljes): between the mountain ranges are fertile plains (Messara, Omalos, Lassithi): palms, olives, bananas, oranges, vineyards and vegetables. While the south coast generally falls steeply down to the sea, the north coast is flatter and more indented, with natural ports and anchorages. The climate is Mediterranean, with comparatively mild and rainy winters and absolutely dry, sub-tropically hot and windy summers which last for 6 or 7 months. Relatively few yacht charters are available in Crete since the island is far away from the regular yacht charters bases of Athens, Paros, Syros, Rhodes, Kos, etc. 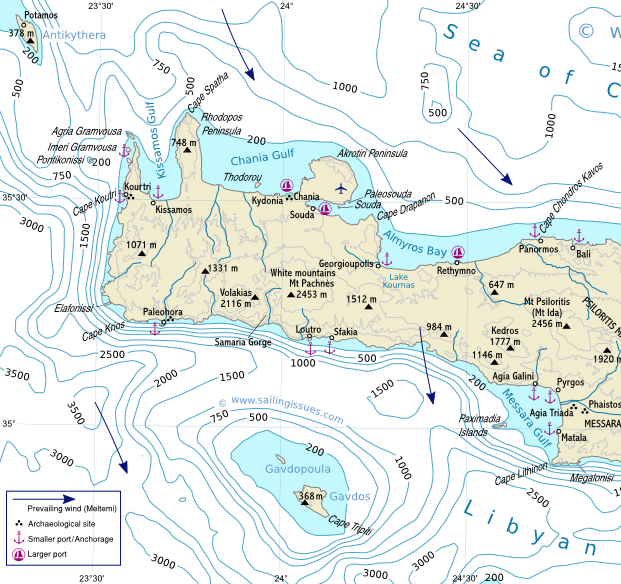 Moreover, adverse weather conditions in the south Aegean Sea (and especially the Libyan sea) and the distances between ports & anchorages on the island prevent most sailors from exploring this beautiful island. Typically only itineraries of more than three or four weeks allow a visit to Crete either from Rhodes or from Santorini. For visitors that bring their own yacht the normal approach is from the Ionian Sea - South Peloponnese, via Kythira, followed by a landfall at Kourtri or Paleohora for the southern coast or Kissamos and Chania for the northern coast. The cruising route continues leaving the island at Cape Sideros and sailing via Kasos and Karpathos to Rhodes. Important: the southern coast is notoriously dangerous during summer winds, since the imposing mountains give rise to strong katabatic squalls! Iraklion, museums and ideal landfall when sailing from Santorini/Thira. The earliest traces of human settlement, by incomes from North Africa, date back to the 7th millennium BCE. From the 3rd millennium onwards there developed in Crete a pre-Greek Bronze Age culture which reached its peak about 2000-1600 BCE and is known as the Minoan culture (named after the legendary King Minos). The Cultural and economic influence of the Minoan Kingdom - the first Mediterranean sea-power - extended as far afield as the Iberian Peninsula. Then about 1600 BCE the Minoan civilization suddenly collapsed, probably caused by the catastrophic Minoan eruption of Santorini. Tephra such as pumice from that eruption can be found all over Crete. After this disaster Crete never recovered its earlier importance. Towards the end of the 12th c. BCE Dorian Greeks conquered the greater part of the island. In 66 BCE Crete was taken by the Romans, who thus gained a base of major importance in the Mediterranean. When the Roman Empire was divided into two in 395 CE Crete became part of the Byzantine Empire, and remained in Byzantine hands until it was taken by the Arabs in 824. Between 961 and 1204 it was again part of the Byzantine Empire. Thereafter followed the long period of the Venetian rule (1204-1669), which saw bitter struggles by the Cretans to recover their independence but also brought the island a considerable cultural flowering. The great painter and sculptor Domenikos Theotokopoulos (born in 1541 near Iraklion and died 1614 in Toledo), better known as El Greco, lived and worked during this period. In 1669 Crete was captured by the Turks, who held it until 1898, when they were forced out by Greek and western European military action. After a period of independence Crete was incorporated in the kingdom of Greece on 5 October 1912, through the initiative of Eleftherios Kyriakos Venizelos (1864-1936), the Cretan-born lawyer and liberal politician who later became Prime Minister of Greece: the recent built international airport of Athens is named after this important statesman. In the spring of 1941 German airborne troops occupied the island, which was of great strategic importance because of its situation between southern Europe and Africa. German forced were evacuated from Crete in May 1945. Present day Chania was founded by the Venetians in the 13th c. under the name of La Canea on the foundations of the ancient city of Kydonia. The old town of Chania is surrounded by a 3 km long circuit of 16th c. walls. On the north side of the town is the Venetian harbour and the remains of the old fortress. The Gothic Church of San Lorenzo now houses the Archaeological Museum (material from the Dorian period). 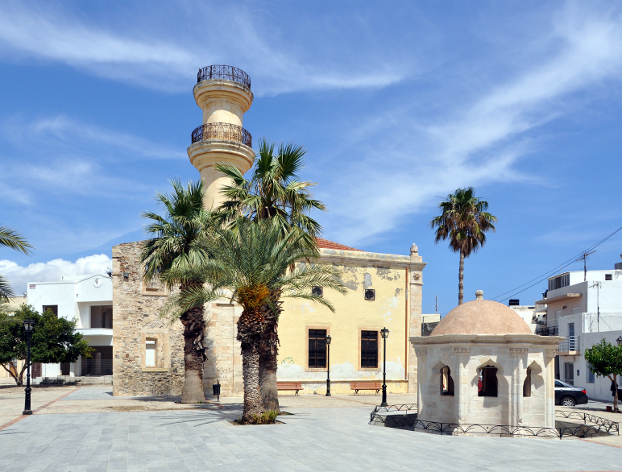 The old part of Rethymno contains many Venetian palazzi , Turkish houses with latticed wooden balconies, a number of small mosques (18 c.) and the Venetian citadel (Fortezza; 14 c., enlarged in 16th c.), with a mosque spanned by a massive dome. The 17th c. Loggia now houses the Municipal Museum. The largest town and principal port on Crete is Iraklion, in ancient times the port of Knossos, but under the Romans it declined; then in 824 it was captured by the Arabs and renamed Kandak. In 1204 it was taken by the Venetians, who called it Candia; and from 1538 onwards it was surrounded by a massive circuit of walls 5 km long designed by the celebrated Italian military engineer Michele Sammicheli. In the 16th and 17th c. there was an important school of painters in Iraklion, one of whom is already mentioned above: Domenikos Theotokopoulos, better known as El Greco. The Archaeological Museum contains the magnificent finds from the palaces and houses of Knossos, Phaistos, Ayia Triada and other sites on the island, giving a remarkable picture of its rich pre-Greek culture from the 5th millennium BCE onwards. To the north of the old town - next to the new port - is the charming Venetian harbour, with a fort on the outer breakwater. Near the village of Makritikhos is the site of Knossos, the island's earliest capital, with the Minoan Royal Palace, which was excavated and partly reconstructed by Sir Arthur Evans from 1899 onwards. This extensive complex of buildings, laid out on four levels on Mount Kefala and originally of two of three storeys, was several times destroyed, presumably by earthquakes, and subsequently rebuilt. The palace was occupied from about 2000 to 1400 BCE, and during this period three phases can be distinguished - the First Palace about 2000-1800, the Second Palace about 1800-1700 and the third palace about 1700-1400. The remains now visible belong mainly to the Third Palace and although there were various alterations and enlargements in subsequent centuries the remains broadly represent the condition of the palace in the 16th century BCE. The complicated layout of the palace provided a basis for the belief that this was the legendary Labyrinth of King Minos, particularly in view of the frequent occurrence in the palace of the double axe (labrys) which was the emblem of Minoan Crete. Gortys was once the rival of Knossos and later chief town of the Roman province of Crete and Cyrenaica, which survived until the Arab incursion in 826. Among the remains are the foundations of the Temple of Apollo Pythios, a Roman palace with baths, an acropolis, an ancient theatre and much more. Noteworthy are also inscriptions on slabs in the Odeion, a legal code of about 450 BCE. The text is written boustrophedon (i.e. as the ox ploughs, with alternate lines running left to right and right to left). 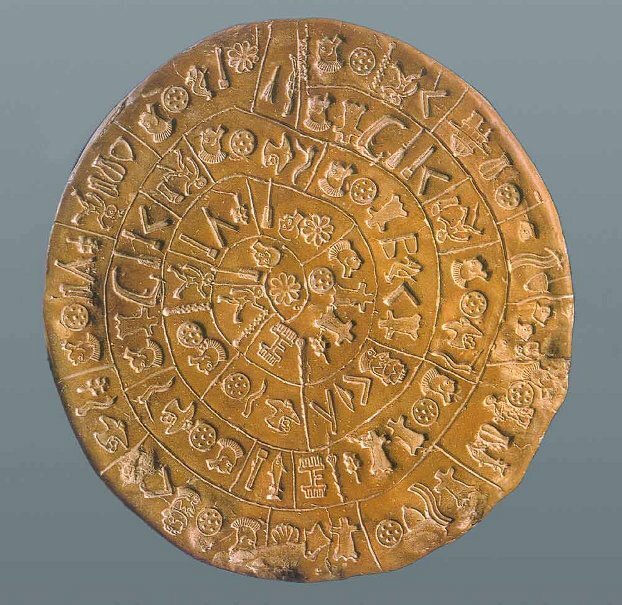 Phaistos city was founded by King Minos and destroyed during the 2nd millennium BCE. At the the east end of the hill is a palace of the same type as the one at Knossos. Built soon after 1650 BCE on the site of an earlier palace of about 1800 BCE which was destroyed a century later by an earthquake, this palace, like Knossos, was in turn destroyed by an earthquake about 1450 BCE. Of the palace buildings there survive only the remains of the west and north wings. The palace is entered from the west side on a monumental staircase 13 metres wide leading up to the propylea . In front of this, to the left, are the tiers of seating of a theatre. From a bastion on the highest terrace there is a magnificent view of the Messara Plain with its surrounding hills. Agia Triada features a Minoan Summer Palace, which remains are just 2 km west of Phaistos originally linked by a paved road. The site takes its present name from a Byzantine chapel on neighbouring hill; its ancient name is not known. The frescoes and pottery recovered from the site are now mostly in the Archaeological Museum in Iraklion. From the west side of the palace there are superb views of the sea and the south coast of Crete. Matala on the south coast was the port of Phaistos in Minoan times and of Gortys in Roman times. The sandy bay is edged by cliffs containing caves which in the Early Christian period were used as burial-places and dwellings. Although it is sometimes possible to start from a Cretan port, many sailing holidays in Crete actually start in Paros or other Cycladic islands. The fast ferry High Speed 7 is connecting every Tuesday, Wednesday and Friday the island of Crete with the Cyclades islands. The fast ferry Champion Jet 2 is connecting Crete with Paros daily. Flights every Wednesday by SkyExpress.